Charming gameboard of the United States with beautiful vignettes illustrating life in each state! The United States Air Mail Game. This is a c. 1929 Parker Brothers gameboard map of the United States. The map depicts the continental United States from the Canada (labeled here as the Dominion of Canada) to Mexico and from the Pacific Ocean to the Atlantic Ocean. Nearly every state is illustrated using an attractive vignette of something for which that state is known. Vermont, for example, bears a drawing of trees being tapped for maple syrup, Texas a herd of cattle and an oil derrick, and most of the Midwest sports an image of either livestock or crops. Georgia and Alabama both hold images of people picking fields of cotton, which creates an interesting historical connotation. Vignettes of ocean liners are included in both the Atlantic and Pacific Ocean. 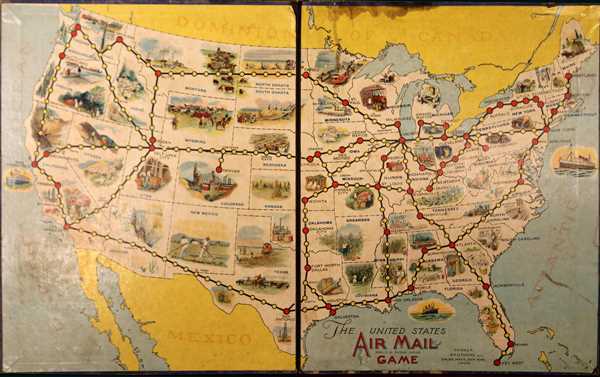 As this is an 'air mail' game, several different routes across the United States are illustrated on the map with red and yellow dots along them. The red dots are American cities of varying size, such as New York, Grand Rapids, Omaha, and San Francisco. This map was published by Parker Brothers c. 1929. This item includes only the gameboard as pictured. Average. Linen backing at centerfold is loose. Water stain along top of board. Moderate soiling. Item includes only the gameboard as pictured.